WHAT DO HUGO's PACK 151 CUB SCOUTS DO? Cub Scouts is an active program. Boys and girls learn by doing, and there is no end to the fun things that Cub Scouts do with their families and Scouting friends. Camp under the stars. Tie knots. Visit a fire station. Shoot a bow and arrow. Build a race car. There is no limit to the fun things your Scout will do! 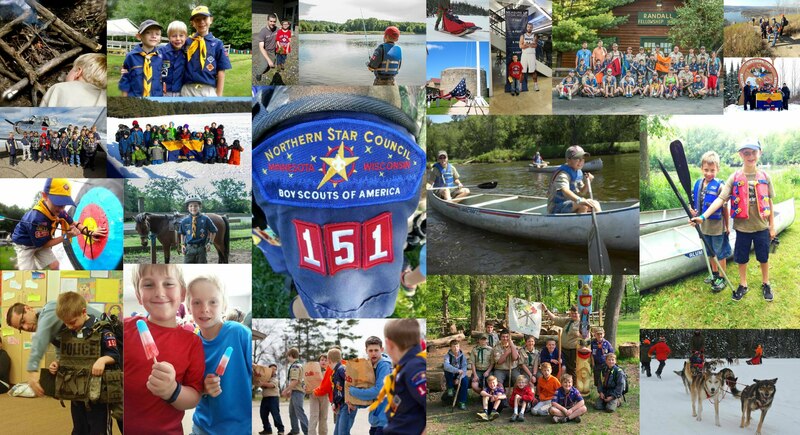 When a boy or girl joins Pack 151, they can expect to have fun doing things like: hiking - team sports - canoeing - Pinewood Derby - horseback riding - St. Paul Saints baseball - making lifelong friends - summer camp - S.T.E.M. - archery - snow tubing - fishing - Wild Mountain - building and launching rockets - Minnesota Timberwolves - s'more's - sleeping in tents - rock climbing - dog sledding - state park visits - bouldering - shooting sports - firefighter, police & EMS visitors - learning about nature - swimming - winter camping - supporting our military - catapults - working with positive role models - Historic Fort Snelling - parades - Monster Jam - ice fishing - Raingutter Regatta - serving our community - outdoor skills - Commemorative Air Force visit - pontoon boating - helping others - high adventure camping - snowshoeing - American Legion Honor Guard visit - cross country skiing - family camping - entrepreneurship - carrying on a proud tradition of the Boy Scouts of America, founded in 1910 and Cub Scouting in Hugo since 1949. RECENT CHANGES - WHO CAN BE A CUB SCOUT? Pack 151 is excited to announce that our Cub Scouting program is now open to boys and girls, Kindergarten through 5th grade. The Boy Scouts of America's mission is to prepare young people to make ethical and moral choices over their lifetimes by instilling in them the values of the Scout Oath and Scout Law. By welcoming both girls and boys into the program, even more youth will have access to the character development and values-based leadership that Scouting promises. Pack 151 will provide a pathway into the Boy Scouts of America's older youth program now called Scouts BSA (formerly known as Boy Scouts). All youth, girls and boys, now have the opportunity to earn the BSA's highest rank, Eagle Scout. Scoutbook.com is our password-protected website that assists Scouts, parents, and leaders in keeping track of rank advancements, and other awards, as well as to allow for better communications. To keep up to date with the most current info, families should subscribe to two Scoutbook calendars: Your individual den calendar and the pack's calendar. Leaders should also subscribe to our leaders calendar.